At last, things worked right. There was a dewpoint ridge running NW through Clovis. A significant boundary was set up more-or-less E-W south of Lubbock. Sheer was best north, surface boundary and CAPE was best south. There was another boundary further north whcih suckered a few unfortunate chasers into the land of no CAPE. We wandered south along the New Mexico border to the Friona, TX vicinity. Just outside of town, we stopped along with Cloud 9 tours and Doswell and Monteverdi, and waited for initiation. It was clear that the atmostphere was trying, but it didn't seem to be trying hard enough. 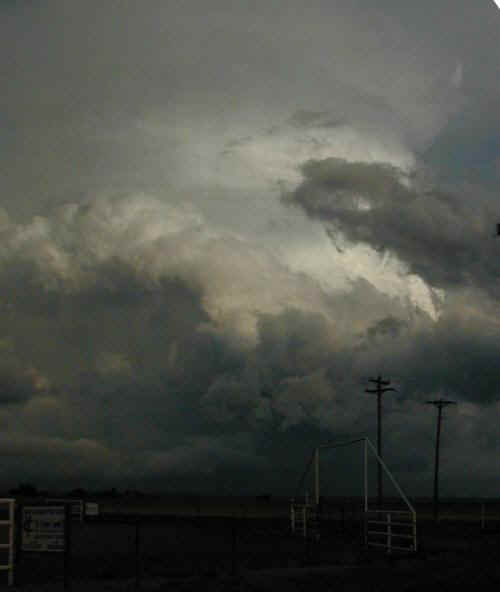 I was about ready to give up and blast for the big storms on the Lubbock boundary, when it finally organized. And boy did it organize. 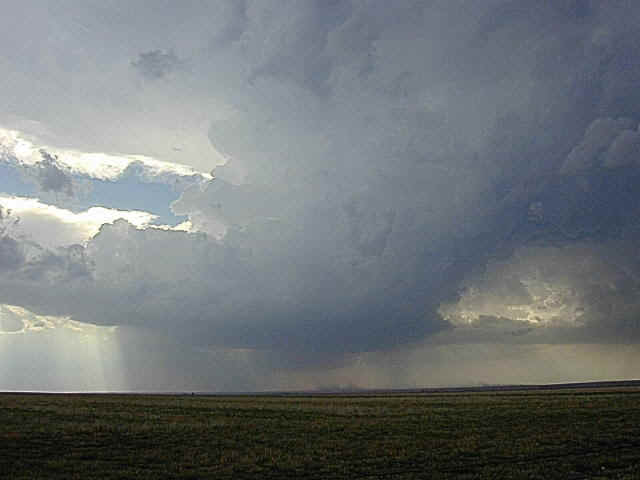 It about 30 minutes, we went from a vague area of cumuliform convergence to a wild vacuum cleaner of a supercell. It formed only a couple of miles from out waiting spot! The inflow was amazing, with dust blasting by us and up into the updraft. This was clearly the storm - probably the best supercell evolution I have seen in years (which attests, among other things, to bad luck in the past). We chased the storm as it moved towards Bovina. As we were just west of town, we watched it put down in rapid succession three tornados. Two were strong dust swirls under a massive rotating base, while the third formed a classic wide conical funnel - although the funnel was brown with dust rather than white with condensation. But there was no doubt this was a tornado! It didn't last too long, so we took off and drove into Bovina. 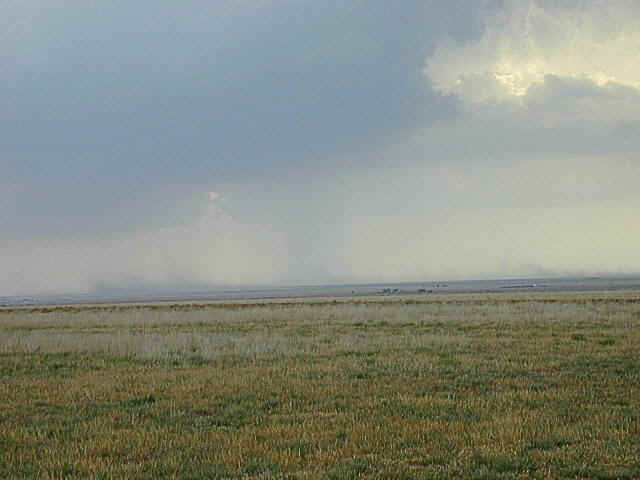 Sure enough, another dust-swirl tornado formed to our NE, ran for a minute or two, and faded away. Sadly, I got no pictures. JOHN, YOU DUMMY! I had been keeping the digital still camera in the same place the whole trip, but when the tornados popped up, it wasn't there! Much time was wasted looking for it (while tornados were dancing around teasing me). Finally I gave up and got the camcorder, but by then they action was over. Oh well. The storm then headed south, with us in hot pusuit. 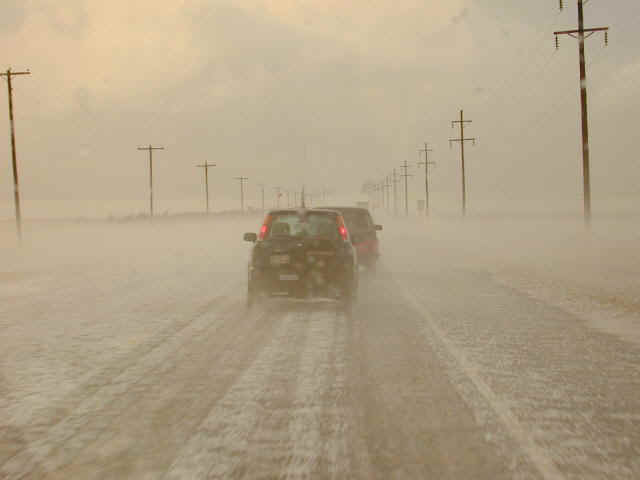 At one point we came across an area where everything was white from hail, and there was quite spectacular hail fog. 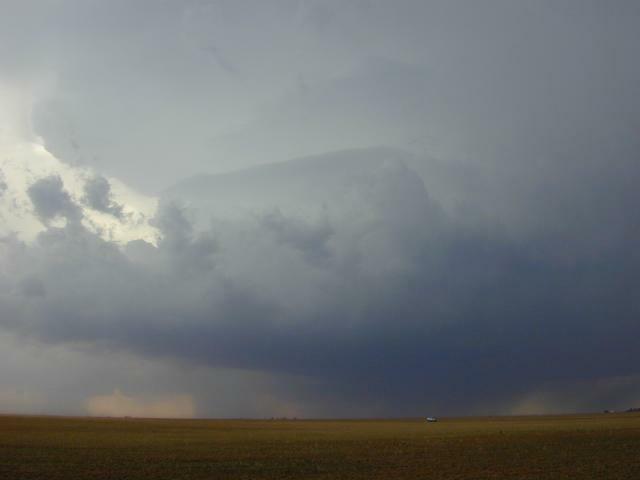 A number of chasers, a film crew and a research radar were pulled over. We tested the traction and decided to go on. Eventually we chased the thing all the way to Levelland, without ever seeing good storm structure again. By then it was dark so we headed to Hereford for the night. A subsequent review of the radar loop showed that our storm formed, tornadoed, and then was whacked by a fast moving left split from a storm further south, after which nothing more happened. None of this was at all apparent from the ground. Here is our storm in its formative stages. Notice the inflow dust under the updraft base. With a little more development, the structure is becoming a classic "inverted wedding cake." Now here is where the tornado pictures would be... if I had any. Sigh.